Following a successful pop up stint, Cutter & Squidge, creator of the much talked-about biskie, has, this month, opened its first store in Soho. A one-of-a-kind fusion of biscuit/cookie/cake filled with lightened buttercream, handmade jams, award-winning caramels and other delights, the biskies are made using only the finest natural ingredients. Totally free from artificial colourings, flavourings and preservatives, these moreish, soft, chewy, cakey and creamy creations are the invention of food-obsessed sisters Annabel and Emily Lui. Opening this autumn, the new shop will sell a whole array of biskie varieties – from Key Lime Pie to Cookies & Cream by way of the now legendary Billionaire (Belgian chocolate, salted caramel and shortbread finished with 24 carat gold). Other treats in store will include vegetarian marshmallows, Dream Cakes, honeycomb, and, of course, Cutter & Squidge Salted Caramel, the proud recipient of no less than 3 stars in the latest Great Taste Awards. You will be able to take your treats away or sit down in store with a hot chocolate or glass of chilled Oomph-ade and devour them on site. And keeping true to a tradition of uniqueness that has been at the heart of Cutter & Squidge since it launched in 2014, this is no ordinary site. For within its walls lies a magical secret garden; a fairy-tale like space complete with a wishing well, hanging plants, flowers and fruits. This enchanting space, which, along with the wider store interiors, has been created by designer Callum Lumsden, will offer a tranquil escape from the hustle and bustle of Soho. And with Harry Potter World and Warner Bros Studio Tours in LA and London under his belt, Callum is certainly the man for the job! With a family background in food, self-taught bakers Annabel and Emily Lui started in a tiny kitchen in North West London. Their aim was to invent new products, recreate time-honoured classics and above all, create cutting-edge taste sensations. Everything is made from scratch and where possible using locally sourced ingredients. All flavourings and colourings are natural… the hulk green of Cutter & Squidge’s green tea biskie derives from premium grade matcha green tea and the crazy pink raspberry biskie is 100% pure raspberry! It’s little wonder that Cutter & Squidge’s creations were soon taking the capital by storm – flying off the shelves at Selfridges and Harrods and causing queues to form outside their Brewer Street pop-up. Now the opening of a new permanent Cutter & Squidge home will prove that you really can have your biskie and eat it. 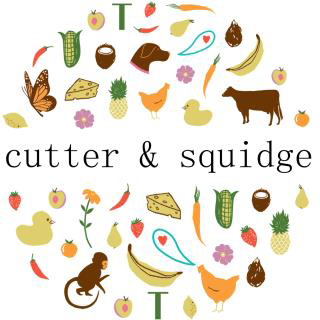 Cutter & Squidge also offers an online shop, featuring a complete range of products together with a selection of fabulous gift boxes.